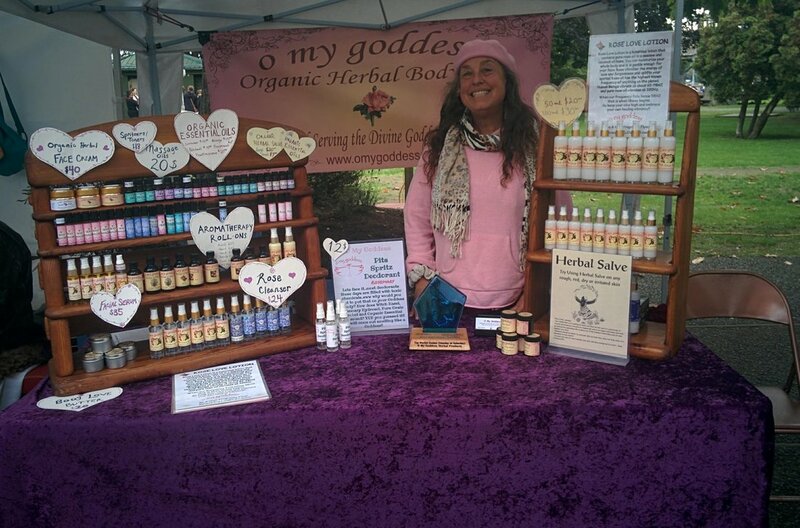 Welcome to O My Goddess Herbal Products of Salt Spring Island. We have been making high quality handmade herb products since 1980. We love the earth and love you too so that is why we use organically grown and wildcrafted herbs. We make it easy for you to care for yourself and nurture the earth too. 7% BC Sales tax will be added to all applicable orders. Organic Herbal Face Cream Moisturising and nourishing- I have been making this amazing cream Herbal Face Cream for over 30 years. It is both rich and emollient and keeps your skin looking smooth and beautiful. I use organic herbs from my garden and organic geranium essential oil. ​This wonderful lotion absorbs easily and makes your skin feel sooo silky.You can use it on your face or anywhere on your body. I like to put some on my heart chakra every morning. It helps me remember to love myself. You can use for massage or to keep a bottle handy throughout the day to put a little on to lift your spirits when needed. It is wonderful for massage and for making your hands silky smooth too. Comes in a glass bottle with a lotion pump. A little goes a long way. Daily use of the Rose Facial kit will not only leave your skin feeling soft, silky and deeply nourished, it will lift your spirit as well!! This kit contains our famous Rose Cleanser, Spritzer and Rose Love Lotion so you can cleanse, tone and moisturize to start your day or any time you need a mood adjustment! This luscious rose cleanser is oil based and will leave your skin feeling clean and velvety smooth. Most cleansers are soap based and they dry out the skin. When you use an oil based cleanser it works on the principal that like dissolves like so oily dirt and grime are easily cleansed from your skin while nourishing your skin with oils of rosehip seed, coconut and jojoba It also contains rose floral water,distilled water, vegetable wax and pure rose essential oil. A little goes a long way. Rinse face with warm water either by splashing or with warm wash cloth. Your skin will feel soooo soft because the oils left behind are nourishing and healing. This has many uses from refreshing your face and tightening up your pores to using as a linen or room spray, It can cool you down on a hot day and really tames those wild hot flashes! Contains rose floral water, witch hazel and a blend of essential oils. Absolutely heavenly. Try using Herbal Salve on any rough, red, dry, irritated skin. It contains organically grown and/or wildcrafted calendula, hypericum, comfrey, olive oil, beeswax, vitamin E, and organic lavender essential oil. The Calm woman has organic lavender and geranium and the Lovers is a synergistic blend of patchouli, ylang ylang orange and cinnamon. Please sign up here for special offers, updates and discounts! 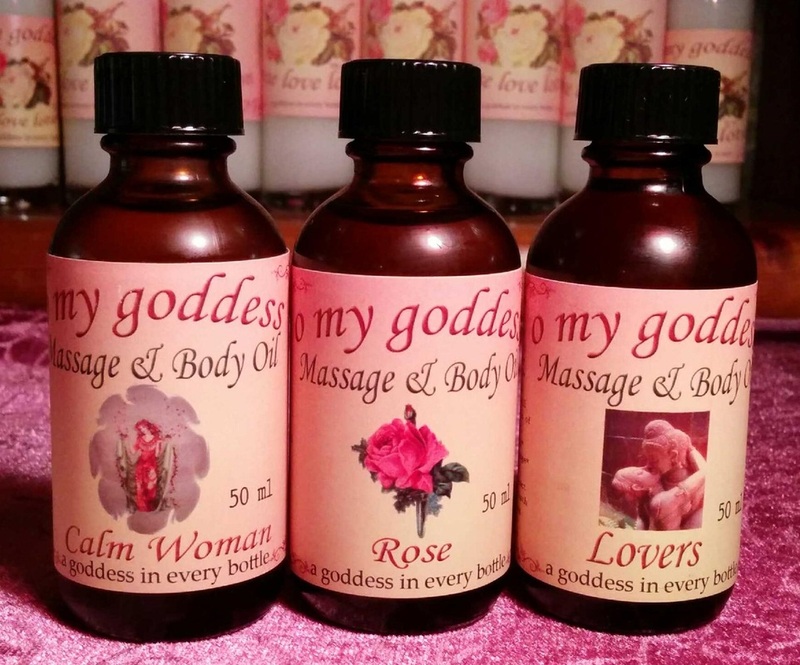 I created Pits Spritz Deodorant as it is more fitting for a Goddess to use beautiful plants on her body than toxic chemicals. Formulated with the 100%pronounceable ingredients of Witch Hazel, Rose or Rosemary Water,Pure Grain Alcohol and Organic Essential Oils. PLEASE NOTE THAT THIS WEBSITE IS BEING UPDATED AND WE SELL MANY MORE ITEMS THAN ARE LISTED HERE. Please email info@omygoddess if what you are looking for is not listed. 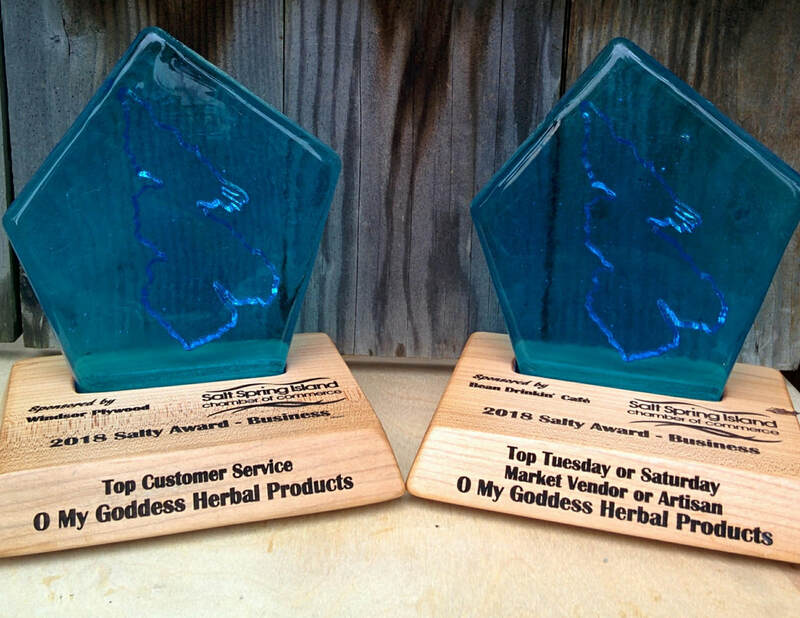 Thank you to everyone who voted for O My Goddess in the Salty Awards! Top Customer Service all of the businesses on Salt Spring!